Things looks pretty good at this limited partnership until you examine one metric. Is one red mark enough to give high-yield Sunoco LP a nay? Sunoco LP (NYSE:SUN) shares are up nearly 15% over the past year, largely on the strength of an early 2019 rally. The master limited partnership has a massive 10.8% yield. Having recently completely a repositioning of the business around fuel storage and distribution, is now the time to jump aboard this high-yield partnership? There's one metric that you need to consider very carefully before putting Sunoco on your buy list. In early 2018 Sunoco completed a deal to sell physical gas stations to 7-Eleven. Prior to that divestment, sales from the retail stores located at these gas stations made up a little more than a third of Sunoco's revenues. The gas sales from these locations pitched in another 28% of revenue. Jettisoning these assets was clearly a huge deal. The sale, however, came with a 15 year take-or-pay contract in which Sunoco would supply gas to the stations it had sold. That's basically what the rest of the partnership's business was all about, so this transaction effectively made Sunoco a pure play on the distribution of gasoline. To be fair, Sunoco still owns some physical gas stations. It leases many of those out, generating rental income (accounting for about 1% of revenue in 2018). The vast majority of its top line today (around 99%) is driven by its motor fuels distribution business. That spans two key areas: the midstream storage of fuels and the physical delivery of fuels to gas stations. Since making the big shift in direction, Sunoco has been able to expand on both sides of the business via acquisition. And management believes there's more room to run on this front. Although the distribution hasn't been increased since mid-2016, Sunoco managed to shift directions without cutting the payment. And, equally important, the partnership's distribution coverage was an impressive 1.3 times in 2018 -- a robust level for a limited partnership. The long-term target for distribution coverage is 1.2 times, with no near-term plans to increase the payment. But with a yield that's already over 10% yield, that's a reasonable stance for management to take. Any extra cash is, instead, going to be put toward growth. Check out the latest earnings call transcript for Sunoco. So far Sunoco, sounds like a great income opportunity, with the lack of distribution growth offset by the double digit yield. Only there's one notable problem that investors need to keep a close watch on: leverage. Although the partnership doesn't have any material maturities to deal with until 2023, it has a lot of debt on its balance sheet. To put some numbers on that, financial debt to equity sat at around 1.3 times at the end of 2018. That's more than twice the 0.50 level of midstream bellwether Enterprise Products Partners L.P. (NYSE:EPD) and higher than the 1.1 level of more direct competitor CrossAmerica Partners LP (NYSE:CAPL). Looking at this same issue a different way, Sunoco's financial-debt-to-EBITDA ended 2018 at 7.2 times. Enterprise was at 3.6 times, and CrossAmerica was at 5.2 times. Sunoco prefers to quote adjusted EBITDA, the figure used in its debt covenants, which was roughly 4.2 times at the end of last year. That makes the situation look much better, but doesn't change the big picture fact that Sunoco has a lot of debt. And with expansion plans that include acquisitions, there's likely to be more debt to come, since management tries to make purchases with a mix of 50% equity and 50% debt funding. This doesn't necessarily make Sunoco a partnership to avoid. However, for most investors, and certainly those with a conservative bent, there are better income-generating limited partnership options available that don't include the leverage risk. Enterprise and Magellan Midstream Partners, L.P. are two such examples. However, if Sunoco's fat yield is drawing you like a moth to a flame, go in knowing that this isn't a set-it-and-forget-it type of investment. 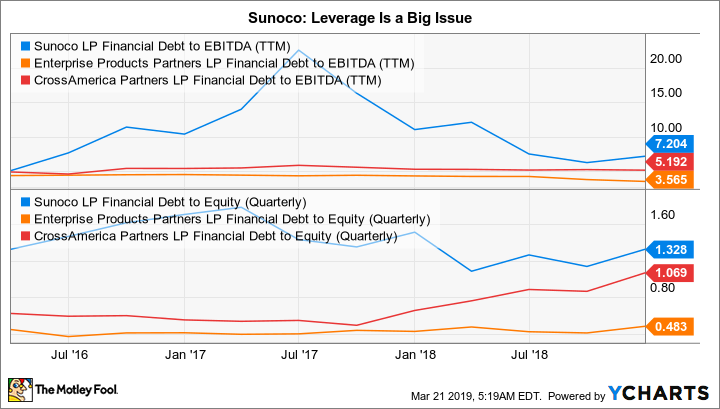 You need to keep a close watch on Sunoco's balance sheet and its ongoing ability to support its debt. At the end of the day, there's a lot to like about Sunoco LP. For example, it has a high yield and strong coverage ratio, and managed a major business transition without cutting its distribution. However, this gas distributor also has a debt-heavy balance sheet. While that hasn't been an issue so far, the partnership's leverage is high and simply not worth the risk for most investors. Only aggressive types willing to pay close attention to their investments should even be considering adding Sunoco to their portfolios.